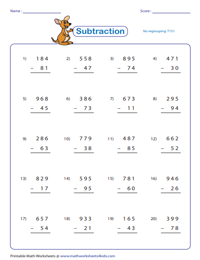 A variety of exercises on three-digit subtraction can be downloaded and printed from this web page. 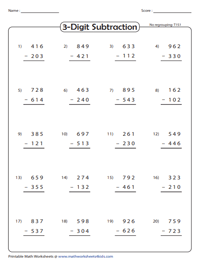 Use these worksheets to review 3-digit subtraction with regrouping and no regrouping. In addition, two word problems are also given in some of the worksheets. 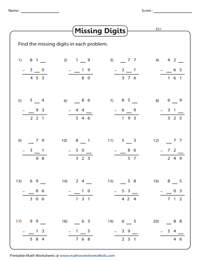 This section also covers a variety of topics like missing digits and circle the numbers. 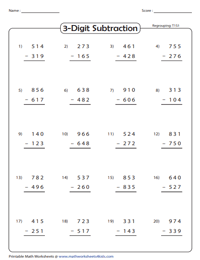 Check out these worksheets for ample practice in 3-digit subtraction without borrowing. Students must subtract 2-digit number from 3-digit number. Answer sheets are also included. All the problems provided in these printable worksheets require regrouping. Review subtraction by working out all these problems. Minuend is a 3-digit number and subtrahend is a 2-digit number. 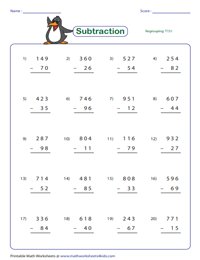 Use these worksheets to get adequate practice on 3-digit subtraction without borrowing. Solve the word problems in each sheet to understand the concept of subtraction better. 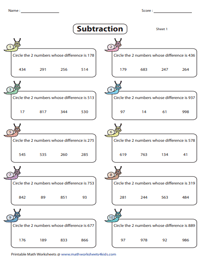 Find math worksheets on subtraction problems by following the link below. Kids can learn three-digit subtraction problems with regrouping. Figure out the missing digit in each subtraction problem. Easy and moderate levels are featured in this section. Add or subtract to find the missing values. A set of four numbers are provided in each problem. Circle any two numbers that have the given difference.